ECHO bikes dominate once again. 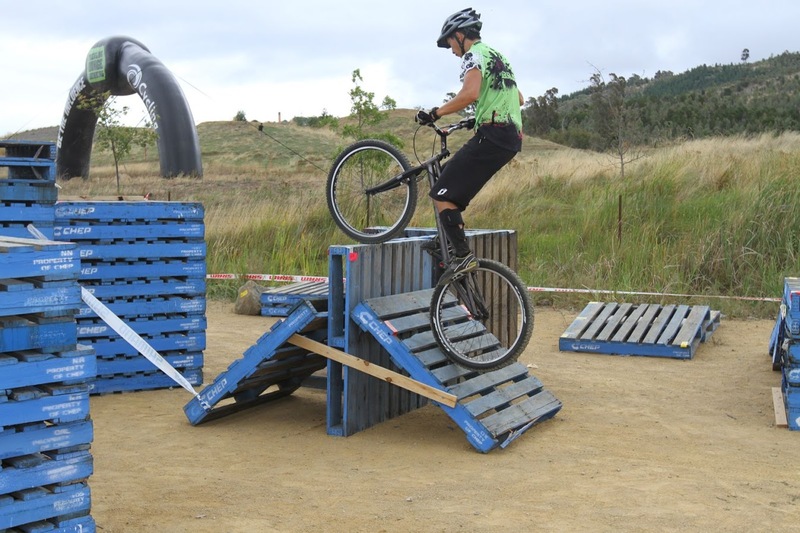 The 2013 MTBA Australian Observed Trials Championships were held on Saturday 23rd February at the Stromlo Forest mountain bike complex. A strong field of Trials riders from throughout Australia descended upon the nations capital for this years championships, which were held in conjunction with the Downhill and Cross country championships. The trials course consisted of a variety of man made and natural obstacles – many still in place from the World Championships, which were held in the same location in 2009. Australia’s best trials riders amazed onlookers with their ability to negotiate extremely difficult and technical terrain including rocks, logs, concrete pipes, and pallets. The terrain was made even more difficult by the blustery conditions and showers of rain. In the prestigious Pro 26” category, last years runner up and 8th place getter in the 2009 World Championships, Joe Brewer took the title with a 4 point margin over fellow Victorian Andrew Dickey. Nathan Mummery, also from Melbourne put in a fantastic effort to finish a close 3rd. The Pro 20” podium consisted of the same highly skilled athletes, albeit in a different order – with Andrew finishing 1st, Joe in 2nd, and 2012 Australian Champ slipping to 3rd place after struggling with the pallet section. In the Elite category, which is one wrung below Pro, is open to men and women, and all wheel sizes, Janine Jungfels (winner of 2 World Cup rounds in 2012) rode superbly to take a convincing victory over the men, also securing the title of Womens National Champion. Another rider who amazed the crowd of spectators and riders alike, was young Jack Favelle, just 6 years old and already demonstrating bike handling skills well beyond his years. Jack was awarded Novice Champion, and also received the 2013 Observed Trials Sportsmanship and Encouragement award. We wish Jack the best of luck with his progress in the sport of Trials. Thanks to Russ Baker from MTBA for the photos.